The following is a news release directly from the International Harvester archives. It was originally published in 1961. At the bottom of the page you can download a PDF version of the original. I have inserted photos of the various trucks so that you can see examples. 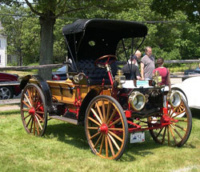 It was in 1907 that a high-wheeled, two-cylinder “Auto Wagon” first bounced over the rutted, muddy roads of America and put International Harvester Company in the motor truck manufacturing business. The company, already well known for bringing mechanization to the farmer, was giving him yet another useful tool – a motorized farm wagon – built specifically to negotiate the rough roads between farm and market. Today, the International truck line is the world’s most complete. Its models range from the light-duty all-purpose Scout, rated at 3,200 pounds gross vehicle weight, to giant highway tractors rated as high as 127,400 pounds gross combination weight. Different as they are in appearance and performance, there is a strong bond linking the early Auto Wagon and today’s International truck line. The air-cooled engine Auto Wagon was made for a specific purpose: that of hauling farm produce over rugged, country roads. Likewise, every International truck built today, and there are thousands of model variations, is carefully designed and built to perform the specific job for which it is destined in the most efficient and economic al manner possible. The first International motor trucks were built by “production teams” of two or three men in February of 1907 at t he company’s McCormick Works in Chicago, but in October of that year the operation was transferred to the Akron, Ohio, Works. Actually they were “IHC Auto Wagons” or “IHC Auto Buggies”, the designation “motor truck” not being applied until 1910 and the trade name “International” not bestowed until 1914. First year’s production was 73 Auto Wagons, a little more than 7 per cent of the total U.S. production of 1,000 motor trucks in 1907. Production increased tenfold the next year when 725 units were built. Additional production space, better production facilities and introduction of the progressive assembly line permitted an increase in production to 2,465 Auto Wagons by 1909. Although they were slow (the instruction booklet warned against speeds over 20 mph) and resembled horse-drawn wagons in appearance, Auto Wagons admirably fulfilled the purpose for which they were designed: hauling produce to market. That they were mechanically efficient is attested to by the statements of an owner who in 1923 still was using an Auto Wagon for everyday hauling, although it had travelled more than 20,000 miles. By 1915, with motor trucks beginning to emerge as an important factor in the transportation industry, production was switched to a limited “line” of new trucks. They were low-wheeled vehicles with increased power and speed. 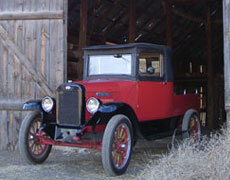 It was one of these that on June 14, 1916, became the first truck to scale Pike’s Peak. Between 1915 and 1925 when the Akron Works was closed, a total of 56,685 trucks in ten different models had been manufactured there, including the first “heavy-duty” truck with a capacity of five tons. It was the U.S. Army’s use of trucks in World War I that gave the trucking industry its first big boost. A great number of military vehicles were manufactured, causing an industry-wide production rise from 92,000 trucks in 1916 to 227,250 units in 1918. However, by the time the war ended, only some 49,000 had been shipped overseas. It was the sale of leftover, surplus units that spearheaded national adoption of trucks, and during that period the slogan, “Ship by Truck,” began to receive prominence. International Harvester again helped lead the way. In 1921, it converted its Springfield, Ohio, plant to motor truck production. Here it designed and built the first pneumatic-tired “speed” trucks, so named because they offered higher speeds to match the road-building progress of the 1920’s. So successful was this truck, and so rapidly was the industry expanding, that International production leaped from 7,183 motor trucks in 1920 to a new record of 39,008 trucks in 1928. Introduction of a new line in 1929 boosted production to 49,797 units. Specialization also reached new heights for International during the period as evidenced by a 1925 advertising brochure entitled “Foiling the Payroll Thug” and describing the 100 armored International trucks built for Brinks Express Company. Soon after opening its re-vamped Springfield plant, the company committed itself to the manufacture of heavy-duty models, the first making their appearance in 1923 from a newly-constructed plant at Fort Wayne, Ind. Today, both the smallest International – the all-purpose Scout – and some of the largest Internationals offered are built there. 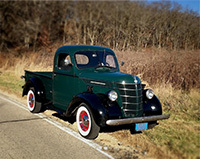 Another significant move in International truck history was made in 1937 when construction was started at Indianapolis, Ind., on a plant to manufacture truck engines. After production began in 1939, this plant grew to be the world’s largest facility devoted exclusively to truck engine manufacture. 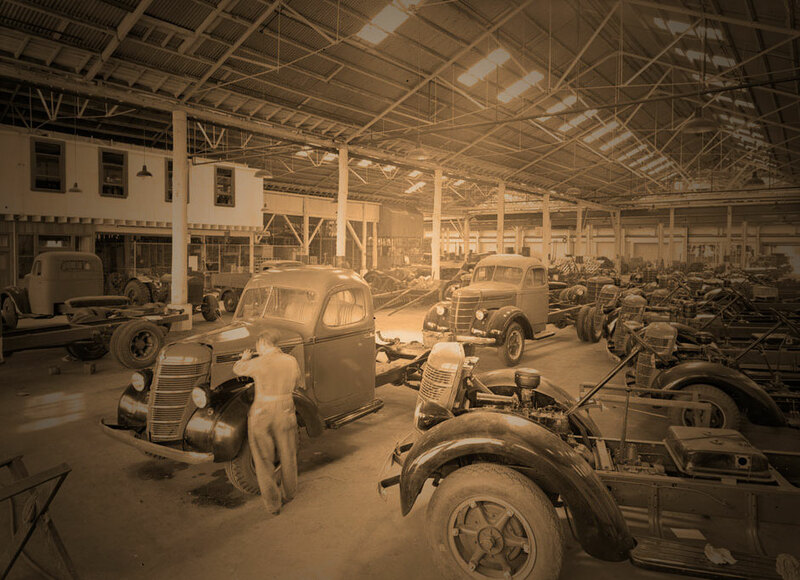 Maintaining its leadership in providing trucks “built to the job”, the company in 1938 brought forth the first International trucks with Metro bodies. A new concept in motor truck design, these multi-stop retail delivery vehicles originally were built under an exclusive contract with the Metropolitan Body Company at Bridgeport, Conn. Now a wholly-owned company subsidiary, the plant since has been adapted to produce both International multi-stop chassis and a wide range of Metro bodies. The “modern” era in International truck history, following the ‘30’s when the “C’ and “D” lines were produced, was entered in 1940 when the company introduced its K-line. It comprised models ranging in size from half-ton pickups to giant six-wheelers capable of handling the largest cargoes then permitted on the highways and hauling of heavy loads over severe off-highway terrain. Production that year reached 86,626 trucks. Before all models of the K-line were in production, however, International began, at the request of the federal government, to design and manufacture all-wheel-drive military vehicles. From December 7, 1941 until 1943, when civilian truck production was resumed on a limited basis, the company concentrated exclusively on building military trucks, armoured half-tracks, gun mounts, shells and other articles of ordnance. 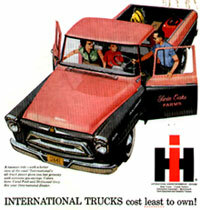 In 1944, the motor truck division of International Harvester Company was formed to handle the growing volume of International truck engineering, production and sales activities. The return of peace signalled a period of great expansion for the truck industry. And, once again, International forged ahead in the field with new designs and model specialization that embraced every area in which a motor truck could have application. The first postwar line was designated the KB-line and appeared in 1947 – the anniversary of 40 years of International trucks. In 1946, the company began production of another new line of highly specialized trucks at a new plant in Emeryville, Calif. The impressive products in this latest link in the expanding company chain were heavy-duty “Western-type” models. Ranging up to 90,000 pounds in gross combination weight, these models were originally designed to conquer the distances and mountainous terrain of the Western states and rugged off-highway hauling jobs. They grew rapidly in popularity, however and now are in general use throughout the nation. Each of these heavy-duty models is tailor-made to individual specification laid down by the requirements of the job it is to perform. It also was shortly after the war that a second truck proving ground was built to complement test facilities established at Fort Wayne in 1929. The new one was located near Phoenix, Ariz. Called the “Desert Whipping Post,” it includes a 7-¼ mile paved test track, a four-mile dirt test track and 11 miles of rugged access roads and grades. There, International trucks are subjected to the toughest tests man and nature can devise. Before a model is approved for production it must survive the pounding of the terrain, the brutal temperature extremes afforded by nearby mountains, the endless miles of consecutive driving and the wrenching turns of this torturous proving ground. Truck transportation and the demand for more and better trucks were sweeping along even faster than the booming general post-war economy. The motor truck division, which in 1948 produced a record 165,600 motor trucks, kept pace with demands and in 1949 introduced the L-line. Offering a “truck for every hauling job,” the L-line was considered a significant industry development. Consisting of 87 basic truck chassis models, the L-line represented a complete re-designing and re-engineering of the International product. More than $30,000,000 was spent by the company to develop these new models and revamp entirely its production facilities at Fort Wayne, Indianapolis and Springfield. Basically the L-line consisted of four-wheel trucks ranging in gross vehicle weight from 4,200 to 30,000 pounds; a series of new multi-stop units; a group of six-wheel chassis ranging up to 50,000 pounds gross vehicle weight; and a group of cab-forward units ranging upward from 14,000 pounds GVW. It was by far the most complete line of trucks in the world. In 1952 the company opened its large and complete truck engineering building and laboratory in Fort Wayne. Staffed by hundreds of engineering and research specialists, this laboratory is the largest of its kind dedicated solely to motor truck development. Three years after introduction of the L-line, it was supplanted with the R-line, which carried specialization to even greater heights. Where the L-line had consisted of 87 basic chassis models, the R-line had 168, in 296 wheelbases. 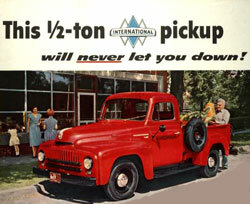 A third development helped make 1952 a significant year in the International truck record. For the first time in motor truck history, International offered the industry Underwriters-listed, factory-installed liquefied-petroleum-gas-powered engines. These “LPG” powerplants offered many benefits in operating efficiency and reduced operating costs to thousands of truck users throughout the nation. 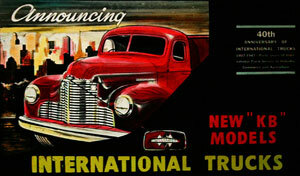 Refinement after refinement highlighted the ever-growing line of International truck models during the ensuing years. Diesel-powered models grew in sales prominence as the market for these units doubled itself annually. In 1954, a CO-line of cab-over-engine heavy-duty trucks was introduced whose shorter dimensions allowed the accommodation of longer legal trailers and bodies. And in 1955, the S-line of light, medium and heavy-duty trucks made its first appearance. The S-line incorporated style-setting design, new power and increased all-round ruggedness and durability. Including a wide and complete range of four and six-wheel gasoline and LPG powered trucks, the S-line offered a selection of 4,200 to 33,000 gross vehicle weight vehicles in almost limitless variety. Earlier in 1955, International four-wheel drive motor trucks were added to the line. And it was at that period that automatic transmissions, power brakes, and power steering were made available. The following year, a series of powerful six-wheel drive trucks was announced. In 1956 the company unwrapped its V-line trucks featuring three new V-8 truck-type engines, designed and built specifically for heavy-duty operation. Typical products of International truck design thoroughness, the engines were laboratory tested for more than 30,000 hours by company engineers. They then were placed in chassis and subjected to more than one-million miles of strenuous road tests at the Phoenix proving grounds. And yet, it was only after thousands of more hours of field-testing in actual fleet applications, that they were judged fit to take their place in the International truck line. The year 1957 brought the 50th anniversary of the company’s entrance into the field of motor truck manufacture, and the milestone was marked with the appearance of two new lines. One was the A-line with the widest array yet of conventional and compact design models in the 4,200-33,000-pound gross vehicle weight range. It replaced the S-line. 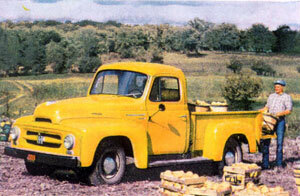 The second was the 405 series of diesel and V-8 gasoline-fueled heavy-duty cab-over-engine trucks. Bumper-to-back-of-cab dimensions on 405-series units were as short as 50 inches. In 1958, with small imported trucks cutting an ever larger slice of the U. S. commercial car market, the International Metro-Mite made its appearance. The Metro-Mite, a 200-cobic-foot capacity multi-stop vehicle powered by a four-cylinder economy engine, was the first compact truck built by an American manufacturer and its introduction signalled the end of rising small foreign truck sales in this country. At the close of the year, the number of International truck models in production was listed as 498. 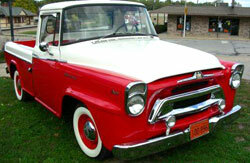 The following year, 1959, International placed its B-line on the market. Like the S and A-lines which preceded it, B-line models ranged from 4,200-33,000 pounds gross vehicle weight. Three new, small V-8 engines made their debut with the B-line and a total of nine different gasoline and “LPG”-fueled powerplants were offered for these models. The company’s motor truck business reached new heights in 1959 with sales totalling $749 million – a record for the motor truck division. This figure was 43.4 per cent of International Harvester’s total 1959 volume. Another record was set in 1960 when sales of International trucks, parts and service totalled $766 million, or 45.5 per cent of company business. Then in 1961, the all-purpose Scout and the C-line were introduced. 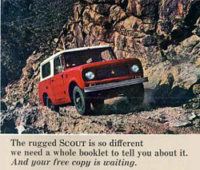 The Scout filled a void which had existed in the utility vehicle market where a combination of passenger car and truck characteristics is sought. Design highlights of the Scout include a three-person cab with removable top, doors and door glass, a pickup body, an IH-built four-cylinder engine and two or four-wheel drive. The C-line, which ranges from 4.200 to 8,800 pounds gross vehicle weight, replaced a portion of the B-line and features “low-profile” styling with overall vehicle heights lowered up to five inches. Today, the International motor truck division is hard at work preparing new developments for truck operators; striving always to provide the best product for each specific job. In the field to market these products and to maintain the more than one million Internationals presently in use are approximately 5,000 dealers and company-owned outlets, plus the largest service organization in the world devoted exclusively to motor trucks. What the future holds for International truck progress cannot yet be seen in specifics. One thing is certain, however: Whatever the growing truck needs of this nation may be, International will be a leader in supplying them.